Part of being prepared for a disaster is investing in solar power kits. If a disaster strikes, whether it is manmade or natural, you may be forced to live off the power grid. One of the best ways to do this is by harnessing the suns natural energy for your own personal use. While there are a number of solar power kits available for residential use, there are 3 types that stand out and are very popular now. Monocrystalline Panels- These panels are made from large silicon crystals. They’re regarded as one of the most efficient types for collecting the sun’s energy and converting it into electrical power. Its ability to work in low light conditions makes this one very effective kit. Polycrystalline Panels- These solar power kits contain polycrystalline panels and are the most common panels on the market. These are a less efficient version of monocrystalline panels, but are much cheaper to buy. Instead of containing a single large silicon crystal, these panels contain numerous smaller silicon crystals. Amorphous Panels- These are made up of a thin film made from molten silicon. It’s spread across numerous large steel plates or other similar materials. These panels are less efficient than the other 2, but are the least expensive of the 3 types of panels. The Readymade kit comes with two 240 watt solar panels, a 500 watt grid tie inverter, and its prewired and configured. The kit comes with a 5 year warranty. When the sun shines, the 240 watt solar panel produces DC voltage and the grid tie inverter will change the DC voltage to AC voltage and puts out power to your home grid generating electricity and cutting your electric bill. It has an easy 2 step installation. First you put the solar panel facing the sun. Then you plug in the cord into your 110 volt wall socket. It is estimated to produce 400kWh/yr. The HQRP Kit uses a monocrystalline panel and a solar charge controller plus HQRP UV chain/UV radiation health tester. The solar cells are sealed high transmission tempered glass. The rear surface of the module is sealed from moisture and mechanical damage. The module is made to minimize weight while still being durable. 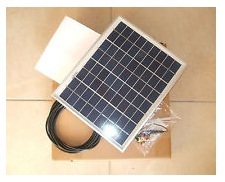 The solar panels are supplied with an MC connector so you will need to buy a cable adapter that is not included. The solar charge controllers are high quality, efficient and reliable solar power regulators. This product is perfect for a rural electrification system. This is a 260 watt monocrystalline solar kit that comes with 2 130 watt solar panels, 30A digital charger controller, 200W inverter, wiring, brackets, screws, and a voltage tester. The panels have aluminum frames for extended outdoor use. They have a bypass diode than minimizes the power drop caused by shade. This kit is great for RV’s, homes, boats, back-up and remote power use. The kit is easy to install and maintenance free. The weatherproof panels come with a 25-year limited warranty. You can also connect more panels to get more power. Sunforce crystalline panels convert sunlight into an electric current but do not store power. The panels are primarily used to recharge batteries. When using these panels to run appliances on a regular basis it is best to use deep-cycle marine batteries. Solar energy is completely renewable. Even though you can’t make use of the sun’s power at night, it always comes back the next day. Most people use oil to power their homes and it is not renewable; when it’s gone, it’s gone for good. Having solar power kits can reduce or end your reliance on oil. Solar energy creates no pollution whatsoever. Solar energy reduces our reliance on oil which when it burns releases harmful greenhouse gasses, carcinogens, and carbon dioxide into the air. Very little maintenance is needed to keep solar cells running. There are no moving parts in a solar cell which makes it impossible to really hurt them and with annual cleaning they last many years. One possible disadvantage of solar panels is that in the case of an EMP, depending on how destructive and pervasive it is, you could lose power as the chips in the inverter and other components are fried.